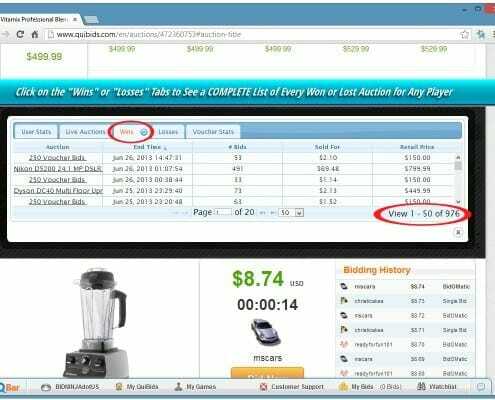 Bid-Ninja Analytics shows you everything about your competitors and the auctions you’re trying to win. 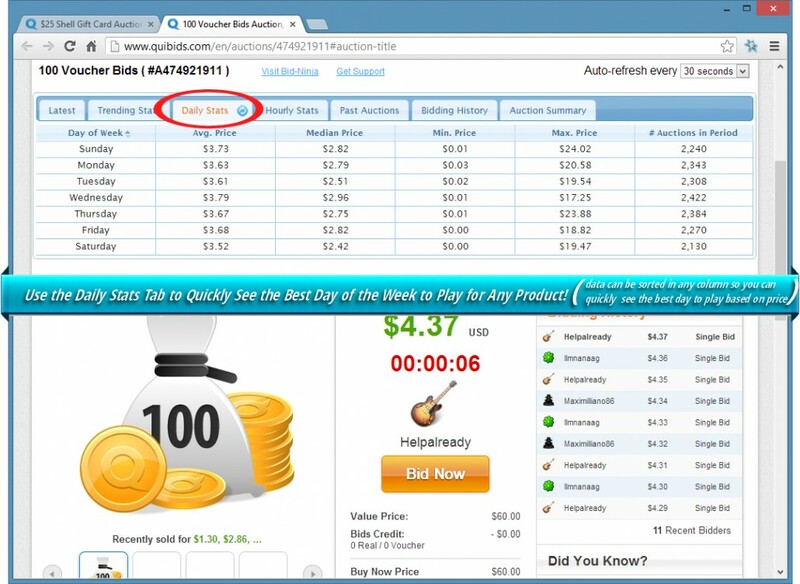 Bid-Ninja’s friendly autobidder uses your own penny auction strategies and places bids for you automatically. Win auctions even while away from the computer! 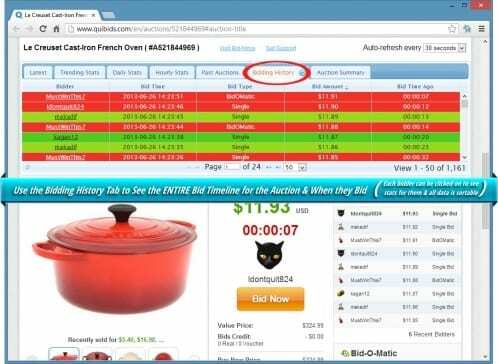 Gives you instant and immediate access to a complete list of every auction on QuiBids, DealDash, and MadBid. 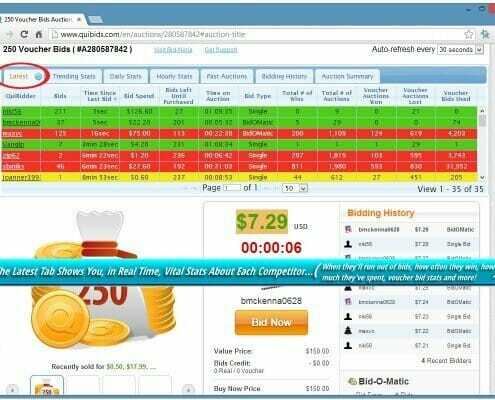 ■ The Analytics portion of Bid-Ninja provides complete picture of the product you’re playing for and the bidders you’re playing against. 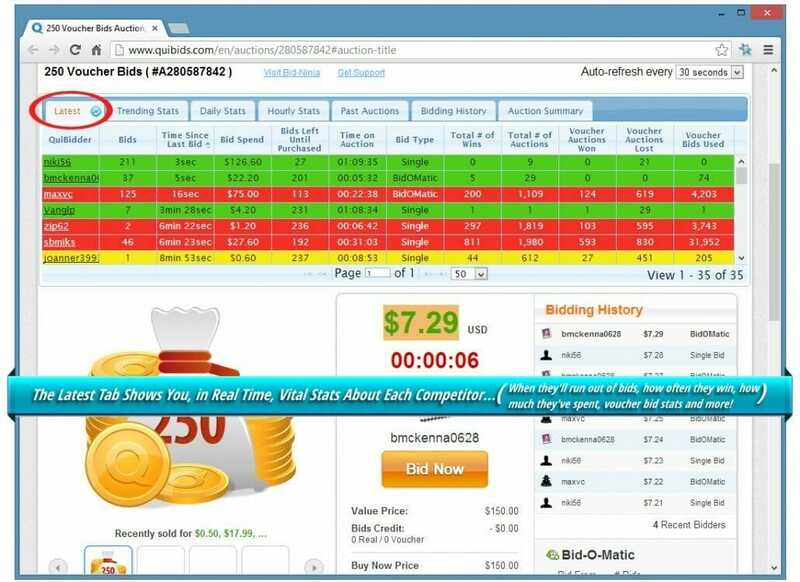 ■ You’ll know everything you need to make informed decisions and win more auctions. 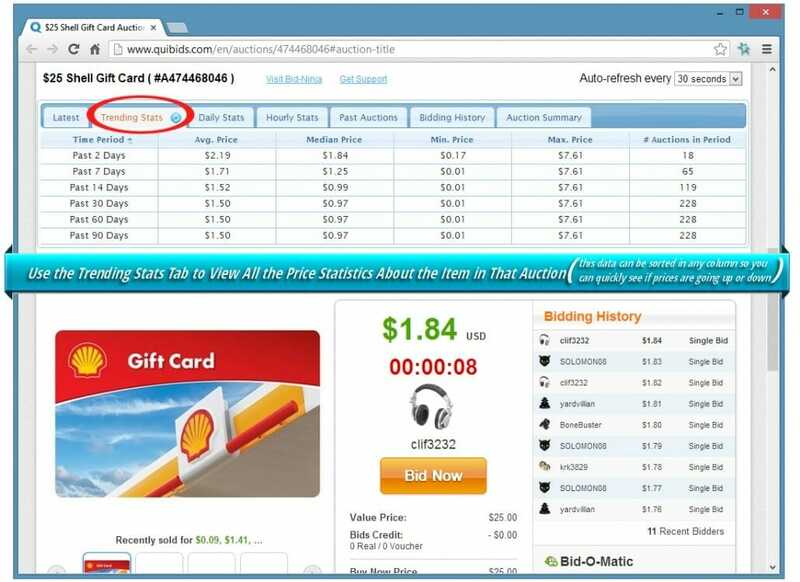 ■ Just navigate to any QuiBids, DealDash, or MadBid, auction. 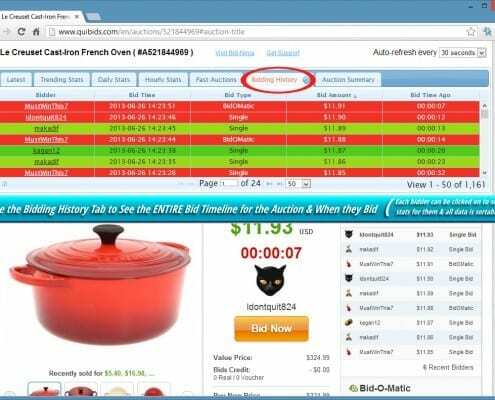 Analytics will automatically & seamlessly appear right on the auction page in your Google Chrome browser. 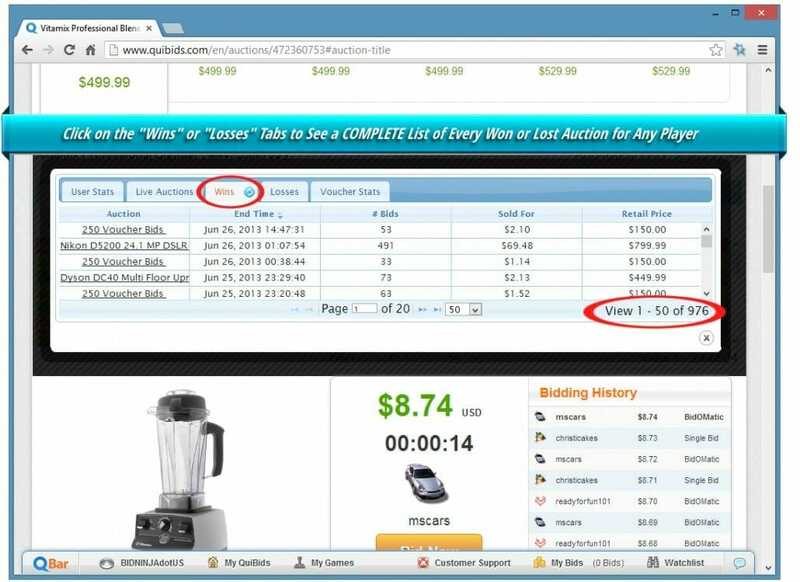 Upon entering any QuiBids, DealDash, or MadBid auction, Analytics will be seamlessly inserted into the auction page. The Trending Stats Tab shows you all of the following information, over the course of the following time periods: past 2 days, 7 days, 14 days, 30 days, 60 days & 90 days. 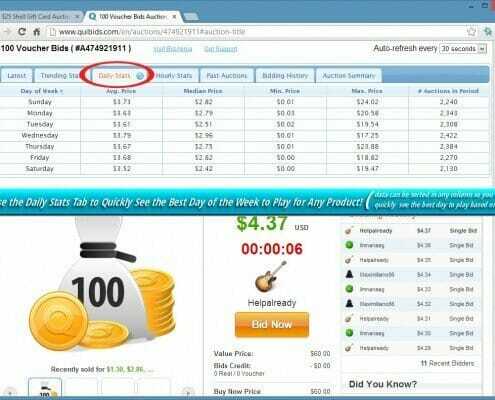 This allows you to see whether the prices for the product you’re viewing are trending up or down. The Daily Stats Tab shows you all of the following information for every day of the week. This allows you to see which day of the week is the best day to play for the product you’re viewing (statistically) be showing you which day of the week the product you’re playing typically ends at the lowest prices. The Hourly Stats Tab shows you all of the following information for every hour of the day. This allows you to see which hour of the day is the best hour to play for the product you’re viewing (statistically) be showing you which hour of the day the product you’re playing typically ends at the lowest prices. 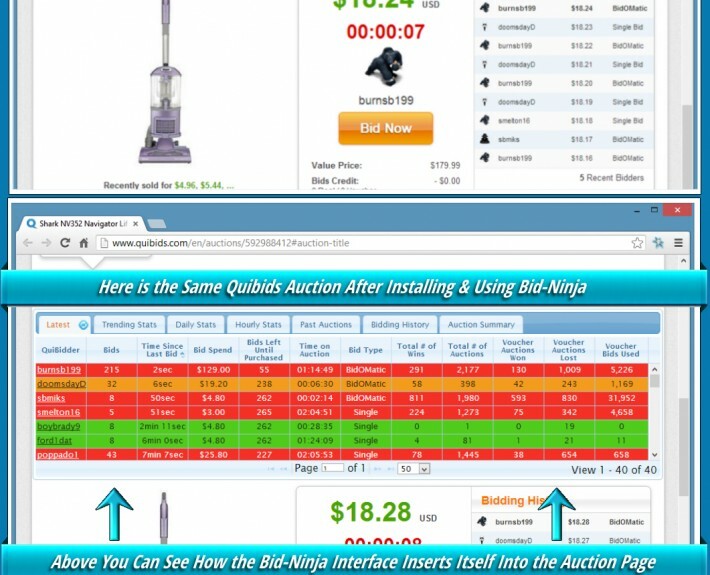 Upon arriving at any QuiBids, DealDash or Beezid auction, Bid-Ninja will be seamlessly inserted into the auction page. 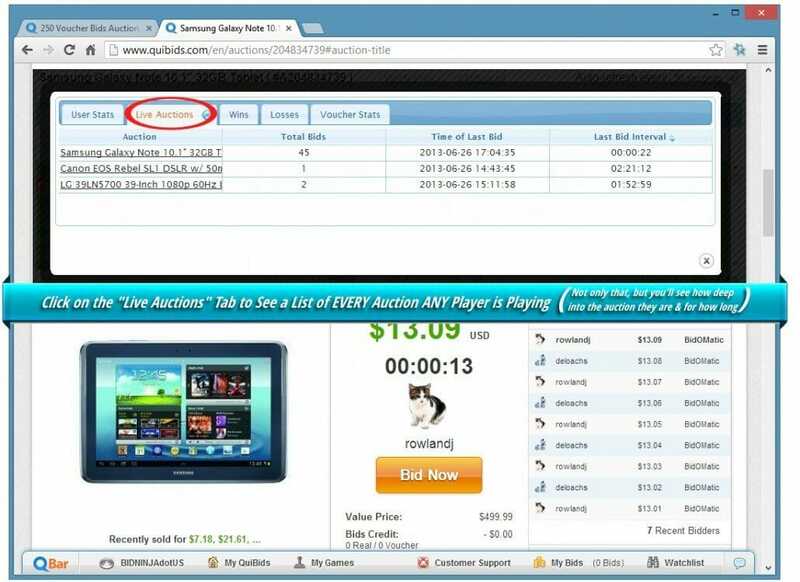 Within the various tabs of information given to you by Bid-Ninja (explained in the Auction/Product Specifics area on this page), you’ll see the usernames of the bidders that have placed bids on the auction you’re viewing. These usernames will be clickable. The total number of auctions that bidder has played on, in total. With the release of QuiBids locked auctions, we at Bid-Ninja see a huge opportunity to give our users an even bigger advantage by adding some new & incredibly valuable features. When a QuiBids auction will lock before it has been locked. This means no more wasting bids trying to prevent yourself from being locked out. You can simply place a bid just before it locks! So imagine, right now, going to QuiBids to pick an auction and knowing exactly how many bidders have placed bids on every auction, which of those users will and won’t be locked out of each auction, how many people you’ll have to compete against after an auction locks AND knowing exactly when the auction will lock before it does? Getting the picture? 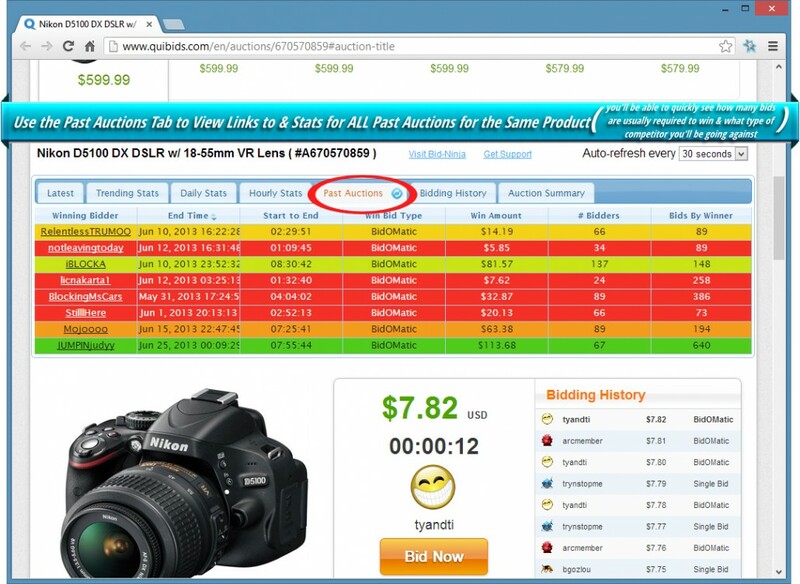 QuiBids locked auctions in combination with Bid-Ninja are an absolute goldmine! 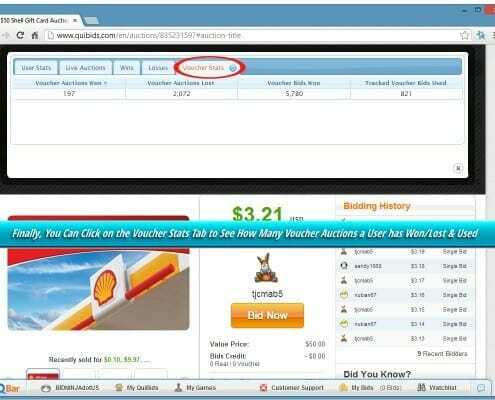 BidBuddy: Win Auctions While Sleeping! ■ If you’ve ever wanted a robot to do your bidding (pun intended), this is your chance. Now you can win auctions even while you’re not in front of the computer. 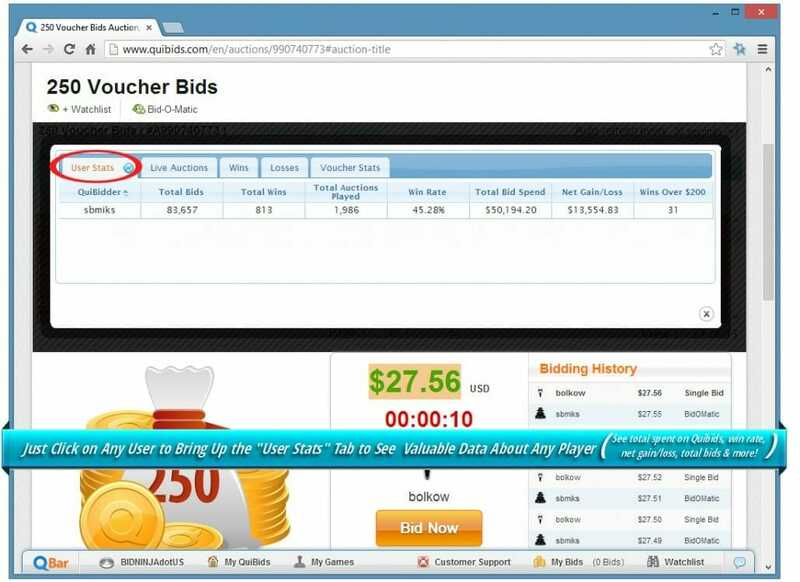 ■ While BidBuddy is easy to use, its powerful features allow you to configure many different bidding options. Click the image to view BidBuddy in full size and see all of the available inputs. 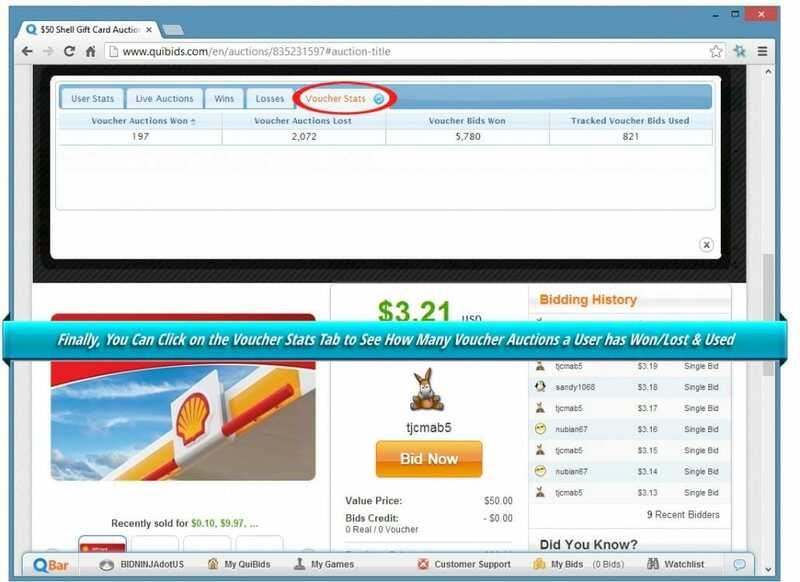 ■ BidBuddy will bid just the way you want and works on multiple auctions, simultaneously. Set it up days or even weeks in advance. ■ Don’t worry again about missing that amazing opportunity to win just because you had to run to the restroom or grab something to eat! The dollar amount you put into the “Minimum Price” area is the price that you want the auction to be at or above before the AutoBidder begins placing bids for you. So, for example, if you were playing on a QuiBids auction for a $50 gift card and you didn’t want any bids placed until the auction was at least $1.00, you would put $1.00 in this field. This field is optional, and if left blank, the AutoBidder will begin placing bids immediately after you click the “Start Bidding” button. The dollar amount you put into the “Maximum Price” area is the price that you want the auction to be below, otherwise you don’t want any bids placed. 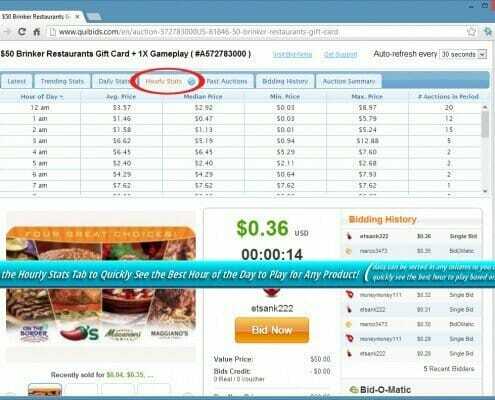 So, for example, if you were playing on a QuiBids auction for a $50 gift card and you didn’t want any bids if the auction is above $10.00, you would enter $10.00 in this field. This field is optional, and if left blank, the AutoBidder will continue bidding regardless of the current price of the auction. Here is where you’ll tell the AutoBidder at what second you want it to place bids for you at. You can input tenths of a second as well. So, for example, if you were playing on a QuiBids auction, you could tell the AutoBidder to bid at 1.1 seconds left on the auction by putting 1.1 in this field. Anytime the auction reached 1.1 seconds left (and you’re not already the high bidder) it will place a bid for you (within the confines of your other set parameters of course). The “Don’t Place More Than ‘X’ Bids” field allows you to tell the AutoBidder to not place more than a set number of bids on an auction. So, for example, if you were playing on a QuiBids auction and you didn’t want to place more than one hundred bids on it, you would enter 100 in this field. The “Bid Only if Less Than ‘X’ Recent Bidders” field allows you to tell the AutoBidder to only bid if there are less than a certain number of bidders that have placed a bid during the last five minutes. So, for example, if you were playing a QuiBids auction and you only wanted the AutoBidder to bid for you if there are less than five bidders in the last five minutes, you would put a 5 in this field. There is a “sub option” here that allows you to tell the AutoBidder to keep on bidding even if the number of recent bidders rises back above the number you put. This is an important feature to use if you are the type of player who “goes all the way” once you’ve placed bids on an auction and you don’t want to stop once you’ve started. This feature is for QuiBids only, as DealDash and Beezid do not have the Bid-O-Matic function. Using this option allows you to tell the AutoBidder to place a certain number of Bid-O-Matic bids before placing any single bids (if any at all). 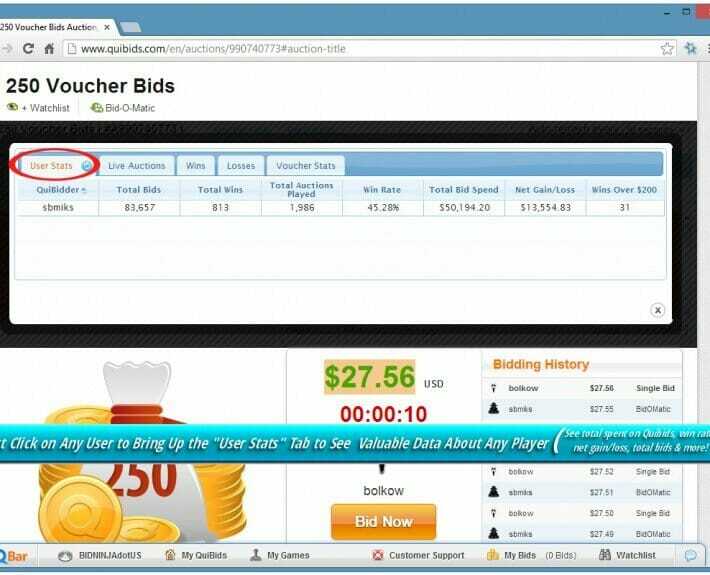 Using this feature allows you to bypass the limitation QuiBids has set that only allows you to place 25 Bid-O-Matic bids before having to “reset the meter” yourself. So you could enter any number you want here. If you enter 121, the AutoBidder will place 121 Bid-O-Matic bids. 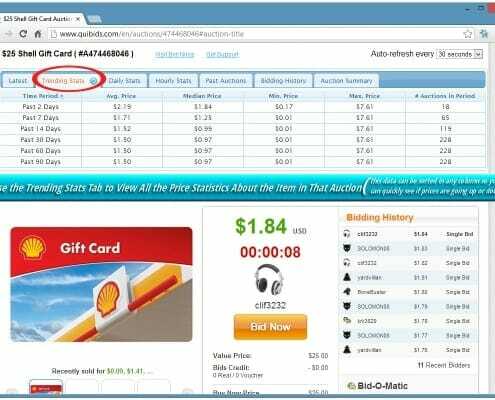 There is a sub-option here that allows you to direct the AutoBidder to completely stop bidding after all Bid-O-Matic bids have been placed. Otherwise, it will continue bidding based on your other rules. 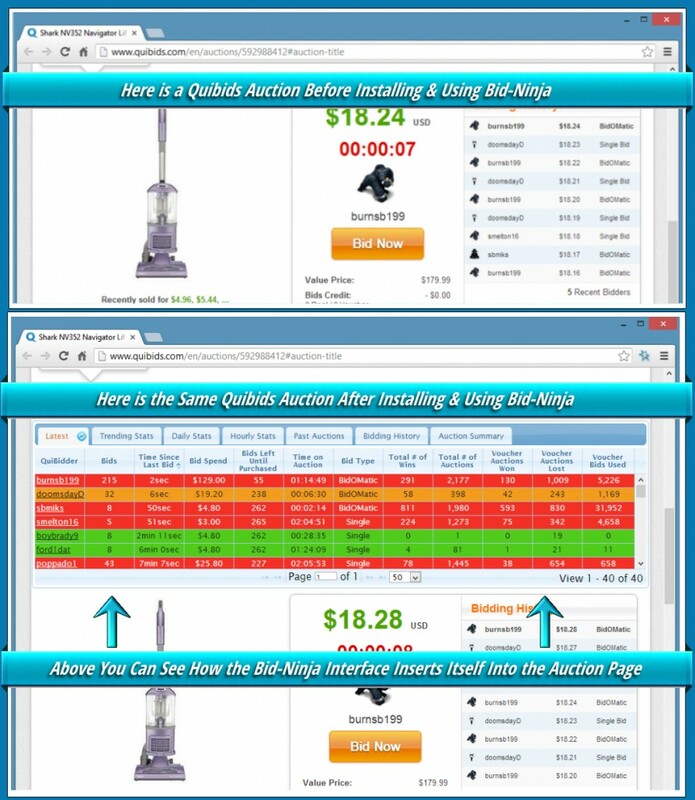 The “Prevent Lockout” option is for use only on QuiBids website, as DealDash and Beezid work differently than QuiBids. 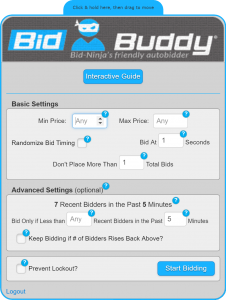 By checking this box, the Bid-Ninja AutoBidder will place just enough bids to prevent you from being locked out of an auction regardless of what you have set the other settings to. This ensures that you don’t ever get locked out of an auction that you wanted to really get active in later. The “Randomize Bid Timing” feature allows you to have the AutoBidder more closely mimic real human behavior. 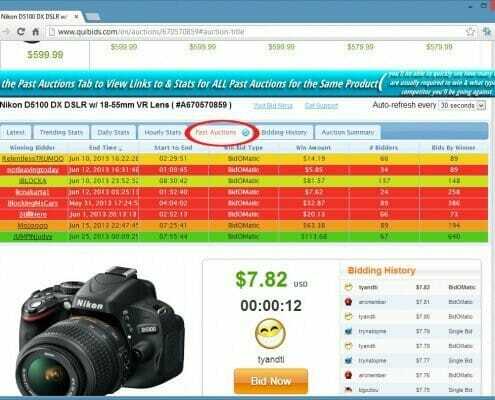 A real person can’t bid at the exact same time everytime, and if you want to look like a “person” to the other bidders, than this features is for you. 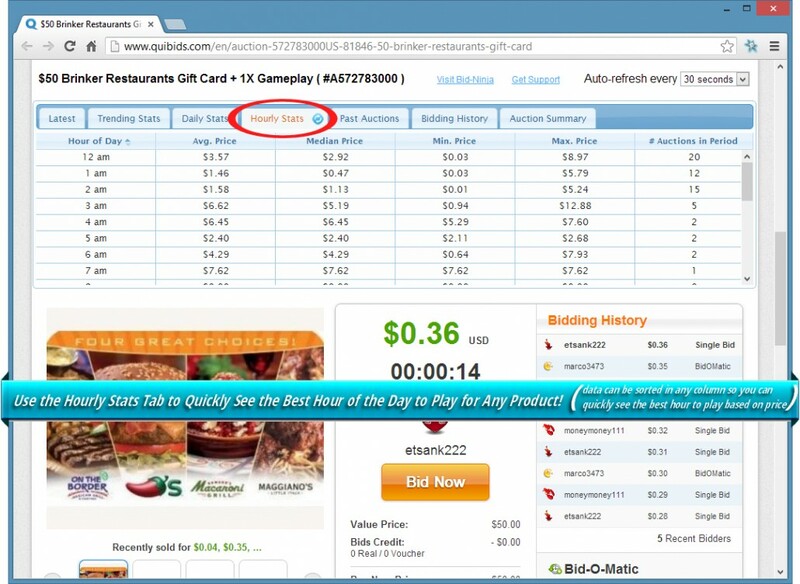 It allows you to input a “minimum time” and a “maximum time” to randomly place your bids at each time. So, for example, if you were playing on a QuiBids auction and wanted to have your bids randomly placed between 5 seconds left and 0.8 seconds left, you would check this box and enter 5 and 0.8 in the fields that appear.